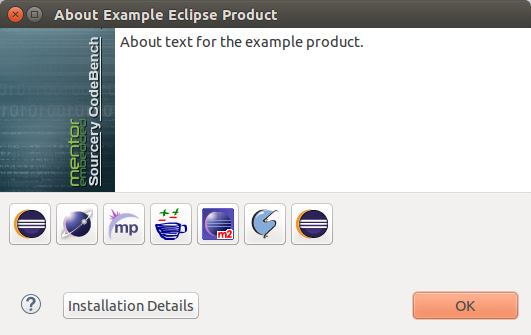 Last year we worked on a new Eclipse-based IDE, in particular creating product branding from scratch. Despite visual editors and several existing online tutorials, that still proved confusing, so I've decided to documented what we've learned. I use artwork we used in our products. The welcome/intro screen is almost neglected, since we use custom HTML for that, and it might be best approach for any new product. Of course, I assume you know what is plugin and what is feature. 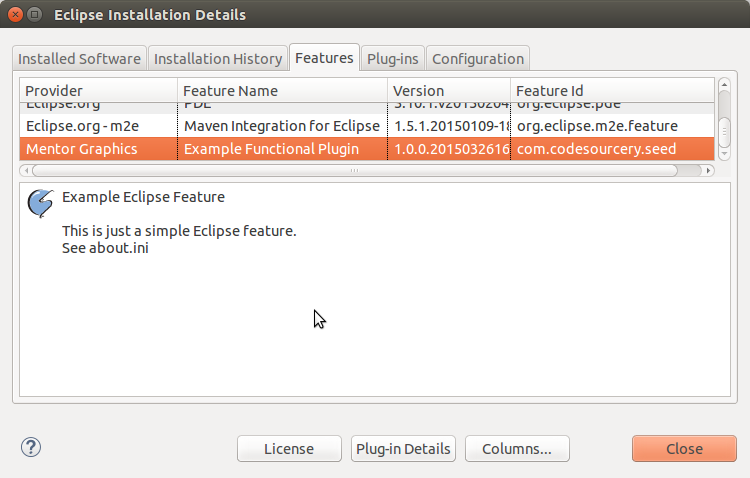 Functional feature, along with contained plugins, implements some useful behavior that you can potentially install into any Eclipse-based product. For example, EGit feature is equally useful for Java and C++ IDE. For proprietary products, it is often tempting to just mix everything together, but creating separate features is often beneficial. The first example is of exactly such standalone feature, see sources. The important files in the plugin are META-INF/MANIFEST.MF, about.ini and about.html. For the feature, feature.xml and about.html are important. In particular, feature.xml relays most of the branding to a 'branding plugin', which, in our case, is the lonely functional plugin. The "Provider" and "Plug-in Name" fields correspond to Bundle-Vendor and Bundle-Name in MANIFEST.MF. The "Legal Info" button opens about.html in plugin's root directory. 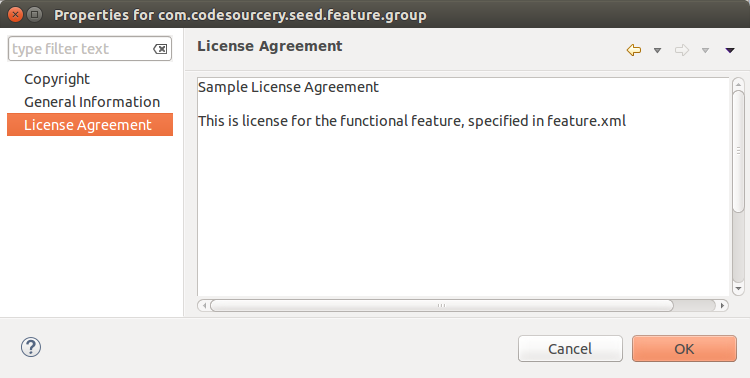 As an aside, I'm not sure why it's called "License" for features and "Legal Info" for plugins and "License Agreement" for installable units. Products put together a set of functional features that make sense for a particular audience, and add particular overall branding. Physically, product consists of a product feature and product plugin, organized the same way as functional feature and plugin. 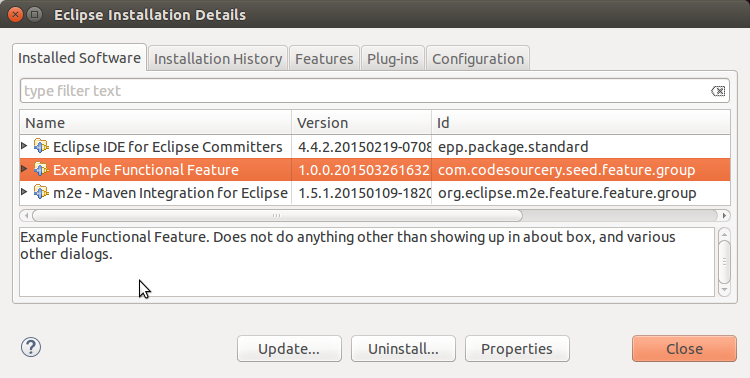 The example source for that is here, which you can again import into PDE, export into P2 repository, and install into separate Eclipse instance, and then run it with the "-product com.codesourcery.seed.product.product" command-line option. There are several other properties in product definition that are related to welcome screen, but as I've said, we replace it completely, so I'm not going to describe it. The example source code has some definitions if you're interested. 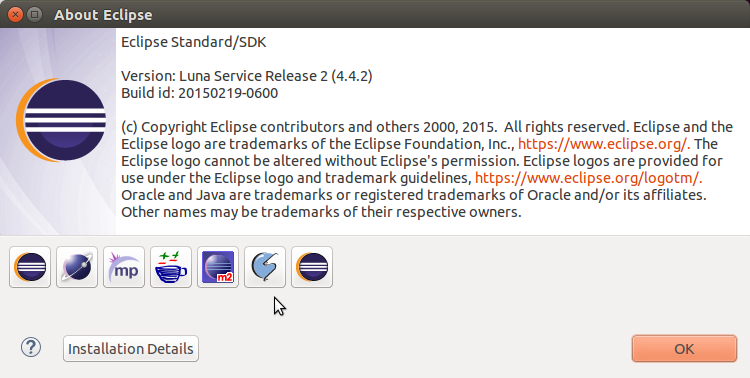 The product configuration specifies them in fairly direct way - the product is specified as attributes of the top-level 'product' element, and the splash screen becomes a command-line attribute to the launcher. In the exported product directory, two files control this behaviour. 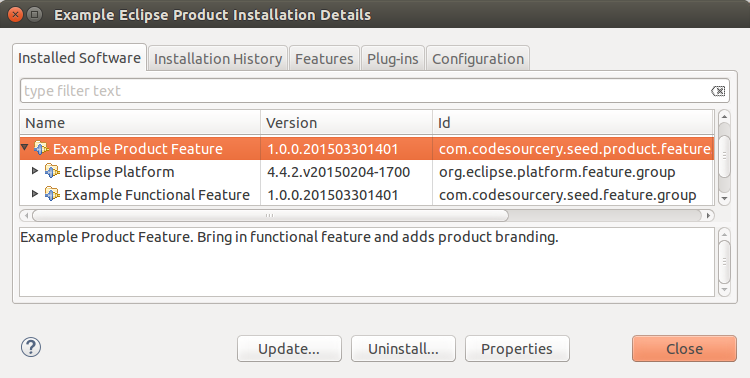 First, the eclipse.ini files in the root directory contains '-showsplash com.codesourcery.seed.product' for the splash screen. Second, the 'configuration/config.ini' specifies the product to run. That almost completes our product branding. Almost, because while product extension point can specify window icon and similar properties, the .product file also can specify those. When you do product export in PDE, the properties from .product files are copied into product extension point, so unless you duplicate them, you get product with no window icons. This problem is accounted for in the final version. We don't have this problem in practice, since we built the final product from the command line, and so splash screen and product id is the only branding we need in the '.product' file. Use high-resolution artwork, preferably created from vector originals, and keep those originals. Having license in every about.html and every feature.xml is awkward. Either automate it, or refer to documentation for license terms. If you can get HTML support working on your target systems, use custom HTML instead of default welcome screen. Dmitry Kozlov has worked with me on this, while Sourcery Services allowed me to take time to summarize our experience.